Perform a site audit via SEMrush API! 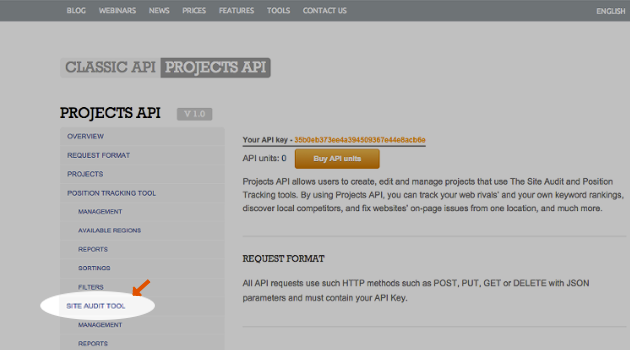 Awesome news for API lovers: all the data that power the Site Audit tool are now available via the API. Want to integrate data related to your websites’ health into your own dashboards or plugins? Now you can easily do everything with site-auditing data: check your website for duplicated content, broken images or any other issues; compare site audits; analyze audit history; or get a website’s on-page health score. Now you can do all that and even more through your custom UI! To use SEMrush Site Audit API, you need to get your API key. If you don’t have one yet, sign up for a subscription, and start curing your website! SEMrush Corporate Plans: Create Your Own Product! SEMrush Launches Product Listing Ads (PLA) data!